Has anyone managed to get a face to face appointment with their own GP without having to wait a couple of weeks lately? I get offered phone calls and appointments with other doctors who always list ne to my symptoms and tell me I need to see my own doctor which wastes my time and theirs. No doubt the box ticking is going perfectly but the real picture is different. When I was a kid you just turned up and waited. Now you wait ages for an appointment and then wait anything up to three quarters of an hour to see them. Progress? What with the paintings all over the Pier Head, the thatch restaurant, and the removal of the balcony above the East Bar door it looks like it is a planning free for all in “Down Town Swanage”. Why are the planning officers so scared to take action? EASTER SATURDAY - 8.30 pm at the Grand Hotel, Steve Darrington Band with Hugh Budden - blues, soul and rock 'n' roll! EASTER SUNDAY - 5pm to 8pm at Bar Seven in the High Stret, Steve Darrington Band with Mike Steele - blues, soul and rock 'n' roll! EASTER MONDAY - 3pm - 6pm at Bar Seven in the High Street, The Refrains - 'Feel Good' songs from the 50s, 60s and 70s with great harmonies too! Recently new campaign groups have sprung up in Purbeck. There may be a concern that there is a decline in peoples involvement in politics but there is certainly not a lack of enthusiastic wonderful people that are trying to make (political) changes at a 'grass roots' level. 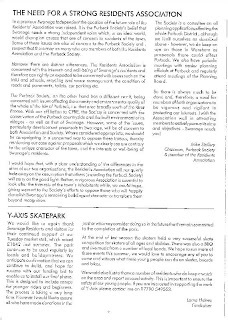 A few years ago Purbeck Housing Action Group was created and led very strongly and successfully by Nico, this opened up the gates for contraversial discussions to take place. What a breath of fresh air! 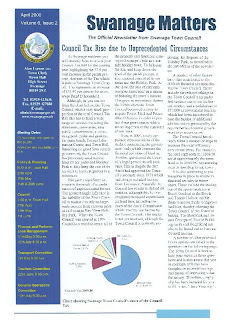 The Gazette enabled many people to voice their concerns. Politicians and councillors took notice. 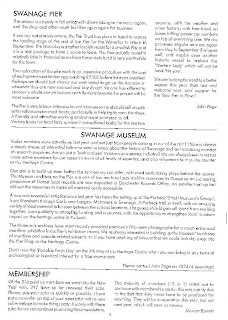 This has had a positive outcome in that the Swanage group has supported other rural groups in eg Devon, Cornwall and Wales. MP Matthew Taylor has presented a sustainable communities report to central government. 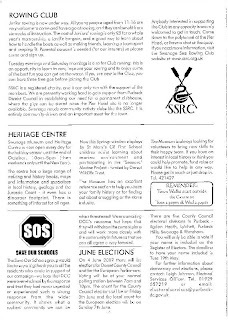 Members of the Swanage housing group continue to be active and communicate with Purbeck District Council over housing concerns. Thank you Nico. More recently groups such as SOS (Save our Schools)and 'Say No to the 2 Tier' have been formed. These groups have attracted many concerned teachers, Teaching Assistants, governors, staff, parents,councillors and members of the community. Two hundred people marched to Dorset County Council to show their strength of feeling! 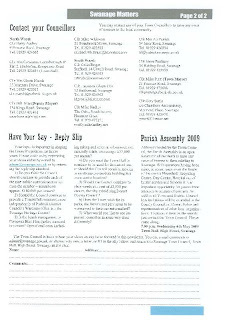 PEAT (Purbeck Environment Action Team)- has been meeting for about 3 years. More recently this group has agreed to work towards 'Transition Purbeck www.TransitionTowns. This group has expanded hugely and attracts many younger people in their 20's and 30's!! It is hoped that the group, by going into schools, will sonn be able to encourage older children too. PEAT has officially joined with the other Transition areas throughout this country and abroad. Transition Dorchester has been running for about a year. They are supporting each other to find ways of creating more sustainable and thriving communities. What all these groups have in common is that they attract many 'active' like minded people from the community, they work hard to try to make a positive difference. They do not wait around for Purbeck District Council to do the work for them. They are inclusive and believe very much that decisions should be made by the community. 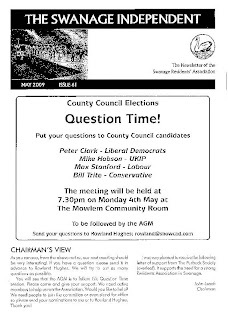 Dave Pratten the headmaster of Swanage Middle School has spoken positively at public meetings. He has highlighted the importance of 'A Vision'. This is what is needed for Swanage/Purbeck. There are more young people wishing to live and work around here, and more young families have chosen more recently to move here permanently because of a healthy lifestyle and good schools. So...somehow we all need to get together and make this Vision happen! There is no reason why it can't! There are little pockets in Devon, Cornwall and Wales that have created sustainable thriving communities. As soon as you arrive, you can feel the difference. If you have any 'positive' ideas of how to create 'this vision' then post them here. Its not all doom and gloom! What do people do nowadays on a Sunday lunchtime - between, say, mid-day and 3pm? Do you stay at home and have a roast dinner? Do you go out? Watch sport? Have a drink at the pub? What would you LIKE to do on a Sunday lunchtime in Swanage? It looks like from tonight we will all have to be carefull of where we visit on the net whom we speak to and censor our own emails this Orwellian Govt: has it wish now, here endeth free speech and privacy!